The flannel fleece blanket could keep you warm and comfortable every month of the year. New-generation printing and dyeing technology makes blanket's color more firmer and brighter .Made with shrink resistant fabric ,No Fading, Pilling, Wrinkle or Shedding . [Material]: Made of 100% polyester, 250GSM . [Color]:Navy Blue, Gray, Dark Gray, Burgundy, White. 1.There is 2-3cm difference according to manual measurement.please check the measurement chart carefully before you buy .1 inch=2.54 cm. 2.Due to the shooting light and different computer monitor, the actually color may be slightly different as pictures. 3.Due to logistics reasons, we use compressed packaging,please kindly washing in cold and dry on low heat then blankets will be soft and smooth . MATERIAL INSTRUCTION:The plush blanket is made of 100% polyester, New-generation printing and dyeing technology make blanket's color firmer and brighter, anti-tearing, anti-clumping. It's wrinkle and fade resistant. 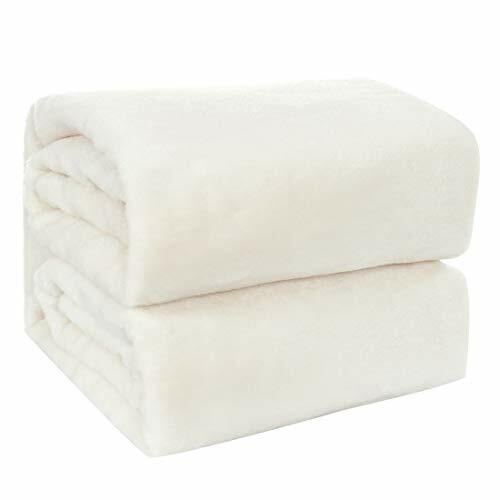 Microfiber blanket is very delicate and dense, so the plush is not easy to fall. SIZE and FABRIC WEIGHT:King--90 by 102 Inch(230*260 cm),Color: White . 250 GSM fleece blanket,We recommend that if you use this lightweight blanket in the summer, you can cover it on your whole body as a blanket. If it is used in winter, it can be used as a bed blanket. SPECIAL DESIGN: Throw Fleece Blanket with Double-side reversible design for added silky feel and improved comfort, Neat stitches enhance strong connections at seams and better structural strength with integrated outlook. EASY CARE: Machine washes below 30°cold water separately on gentle/delicate cycle.Do not bleach/do not Iron /line dry in shade. The throw blankets will be softer if use little softener when soak .soaking time within 30 minutes. OUR SERVICE: Our Flannel Fleece Blanket have a 100% satisfaction guarantee. If not happy, for whatever reason, we'll take care of you with a full refund or exchange.